In the hit 2012 movie The Avengers, the Norse trickster god Loki threatens a crowd and makes them kneel before him as he delivers a speech about what he thinks of the human race. As I was watching the movie, I was properly outraged at the character’s assertions. I remember thinking that he was going to be surprised at the fighting spirit inherent in the human race. But as I sit here tonight watching the Democrats across the country systematically stripping away the self-defense rights of their ‘subjects’ one state at a time and being praised by their sycophants for doing so, I am made to wonder … perhaps Loki was right after all … at least where some humans are concerned. There seems to be a subset of humanity that does indeed crave subjugation, even in America. We call them anti-gunners. They cower and whimper in fear whenever faced with the responsibility and cost of freedom. Instead they beg for the safety of a prison and the ‘protective’ hand of an all powerful government. So how do we deal with a nation divided between those who would be free and those who would rather seek the safety of servitude? In truth, I honestly do not know. I just do not know. I can only continue to believe that the spirit of individual freedom, responsibility, and exceptionalism has not perished from the face of the Earth. This entry was posted in General Civil Rights. Bookmark the permalink. Too often in this struggle for our rights, for our freedom, we tend to play by the rules we are taught as children – to play fair. As adults we allow this to be transformed into political correctness (PC) There is no fairness, no PC in being subjugated. I bow to no man, but will stand beside all who will speak and act against oppressive leadership. We have paid dearly for our freedom, yet some would sell it for a pence and be the poorer for it. No more, that account is already overdrawn. I do not claim to speak for others, but I would much prefer a compassionate anarchy in which everyone is ruled by their moral compass as opposed to a dictatorship, no matter how benevolent. The people who wish to be subjugated have every right to do so. In the meantime, leave the rest of us alone. I believe the statement was absolutely correct. I also believe that your assertion that the ones who crave this are only anti gunners is absolutely incorrect. It is inherent in human nature to need to be subservient to something, whether that something be a government, boss, King, a code of moral beliefs, or a God. Almost to a person, even the most freedom loving, pro gunner, believes in a higher authority, whether that be solely his God, or even the needs of his fellow man. Very few of us believe we are a power unto ourselves, answering to nothing and no one. There are those of us who are extreme in this belief, taking as little responsibility for their fate as is possible. I believe most anti gunners fall into that category, but then again, so do most gun toting Bible thumpers. Even the most atheistic anarchists believe that you can’t just do whatever you want, if it infringes on another. If you got a problem with “Bible Thumpers”, Joseph, I suggest you keep it in your pants. The term is “Christian”, and if you don’t like us, or the way we live, I also suggest you find some where else to play, and mouth off to. Humanity, as you understand it, is some ant hill free for all, where all do as they might. Fine, that’s YOUR picture, and you’re welcome to it. Anti -gunners DO want to dominate, and rule over a disarmed populace, whenever and wherever possible, so, please, stop lying about it. And by the way, brainiac, a person has a choice, when they decide to accept the Kingship of G*d, and it’s always voluntary. Sort of makes that whole “seeking to be subservient” idea a little liquid, doesn’t it? And the matter is a spiritual one, at that. Christians live in the world, but at the same time are ruled by a Just G*d. BY DECISION. 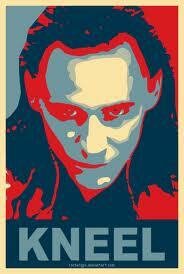 Loki, as a fact, is a mythical god made up by the Norse people, along with all the trappings that went with that. Evidently, you crave being subservient to your own spoutings, whatever they may be. And Bibles aren’t the only thing that get thumped, here in Texas. Try not to lump us in with the anti-gunners, as it don’t fit. Oh, and we’re not turning the other cheek here, as that is a urging from Christ, when teaching the Apostles to evangelize. Offensive and wrong headed characterization of Christians as Bible Thumpers Joeseph. As believers in our spirtual God, there is a foundation, the Bible that guides us. We live it boldly and unashamedly. There is charity, but also discernment. If folks wish to destroy the principles that lift up society, then it’s recognized, always oppossed and never condoned. If evil confronts me, I will counter it with wisdom, not whatever feels right, forcefully if necessary. Hmm, yes, and your “God” is a mythical god made up by Jewish people. I will say to Joseph, however, that he lacks morality. Which is, of course, a rather childish position to find oneself in. Joseph, there is nothing “subservient” about adopting the principle of non-aggression. It is voluntary. I choose to believe that it is immoral for me to behave aggressively, and I choose not to do so. It’s obvious that you feel a sense of superiority for your having decided that your are subject to no limitations on your behavior whatsoever. The rest of us are mere sheep, right? Your thoughts are cute, but they aren’t as unique as you seem to think. You know who else routinely makes arguments like yours? Nihilists, and serial killers. I doubt you’re a serial killer, but I hope for your sake you develop, at some point, the empathy of an adult. I can categorically say you lack this, as I thought the way you did when I was 10, before I developed normal adult empathy. The mind of a child is a truly stifling thing to inhabit. Once you develop empathy, your way of thinking becomes a philosophical exercise, considered and discarded.